Dr. Parameswaran Subramanian has obtained his MBBS from Lokmanya Tilak Medical College, Sion, Mumbai. He later obtained his MD (Radiology) from the Rural Medical College, Loni, Maharashtra. Dr. Parameswaran has over 10 years of experience in the field of Radiology. He started his professional career at the Breach Candy Hospital, Mumbai, India, before joining Nidan Annexe Hi-Tech Imaging Centre, Mumbai, India as a Consultant Radiologist. Prior to joining NMC Healthcare, Dr. Parameswaran was also a Consultant Radiologist at Nivaran Dual Source CT, MRI & Dental Imaging Centre, Mumbai, India. 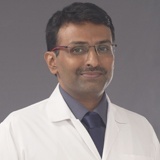 Dr.Parameswaran is proficient in USG, CT and MRI with special interest in Chest and Cardiac CT.
Dr. Parameswaran has attended many courses and workshops and has conducted paper and poster presentations at conferences. Dr. Parameswaran is fluent in English, Hindi, Marathi and Tamil.